www.edsfashions.co.uk – LAST ONE..BUY NOW! A fantastic oilcloth bag for your lunches, pack your salad box and fruit in this funky bag. Also great for filling with nappies for a special newborn, or packing with your craft items, its a smashing gift! 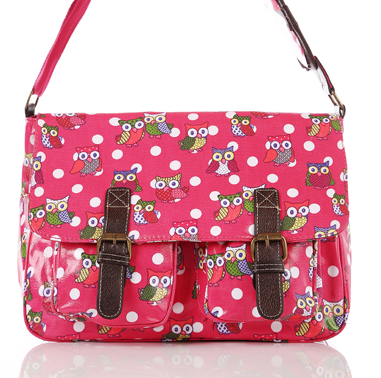 Beautiful, OILCLOTH OWL PRINT CROSSBODY, CROSS BODY Satchel, for children and Mothers.. This is a beautiful Bag for the Summer, beach, holiday, travel..